London, 05.10.1905, 5 % Gold Loan über £ 100, #3148, 46,7 x 33 cm, grün, gelb, schwarz, rot, Stempel, KR angeklebt, Knickfalte quer. 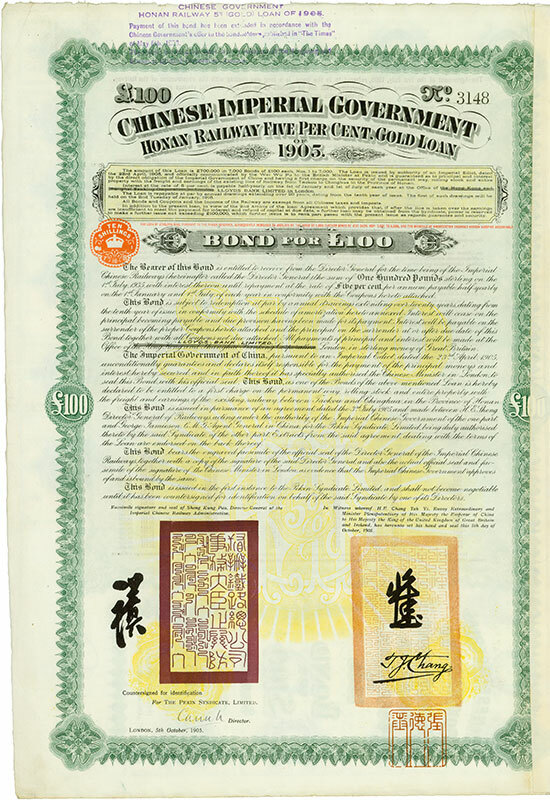 London, 5 October 1905, 5 % Gold Loan for £ 100, #3148, 46.7 x 33 cm, green, yellow, black, red, stamp, some coupons remaining (stuck on bond), horizontal fold. Die Anleihe wurde aufgelegt um die 95 Meilen lange Strecke von Taokow nach Ching Hua in Honan zu bauen. The bond was issued to raise money for financing the 95 miles of railway track from Taokow to Ching Hua in Honan.